At the beginning of last month, I began a series — 31 Days of Festive Fall Drinks. It is now the 2nd day of November, and if you look closely at my list, there are only 30 drinks on there. 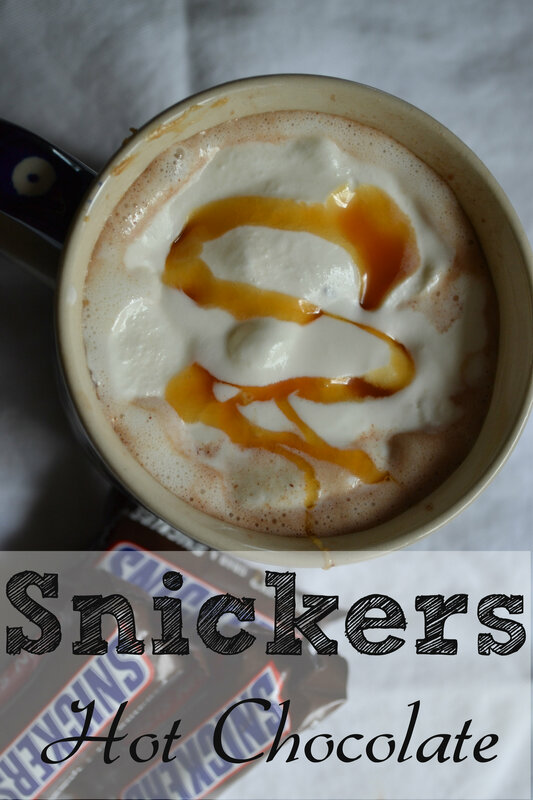 So, as a woman of my word, here is the last drink — a few days late but a no less tasty Snickers hot chocolate recipe. Add one spoonful of peanut butter and stir until dissolved. If you’d like to steal some Snickers bars from your kids’ Halloween candy to chop and sprinkle on top — well, you wouldn’t be the first. Want more tasty, delicious drink recipes? My new ebook “Drinks for All Seasons: Fun and Festive Drinks for Any Occasion” has more than 40 recipes for a variety of drinks. The book includes warm drinks like hot chocolates, coffees, and lattes; cocktails (warm and chilled); smoothies and so much more! You can find the ebook here – it’s full of fun, delicious drinks for parties, or just for making up while you hang out at home with the family. Tried this…..IT WAS AMAZING. I added a little extra peanut butter 😉 sprinkled a snickers on it, then devoured the second one before I could crumble it. It was sooo good. Ha ha! Glad you liked it! What a great idea! I love peanut butter but never thought of adding it to hot chocolate. I can believe the combo of that and the caramel makes this amazing! Can’t wait to try it. Thanks! Yes, it’s quite yummy! It is! Not exactly good for you, but really tasty — I hope you like it! Sounds pretty tasty! just popping over from the Inspire Me Mondays Link Party. I have pinned, liked and tweeted, and g+-ed. I would love it if you would drop by my site at http://www.kneadedcreations.com for a short visit! I will look forward to seeing you there! Deb @ Kneaded Creations. Yummmmm Yummmm. I really enjoyed this inspirational post. I would love it if you would share this post at our What’s It Wednesday linky party? Hope to see you there! Oh my. Why have I never thought of adding peanut butter to hot chocolate? What a great way to end your series, too! thank you! Yeah — I’m not going to pretend it’s good for you…but it’s oh so yummy!